I'm turning back again to thinking about journaling. That balance I want to achieve between having the page look the way I want it - and having the story. So, inspired by Mitra's thoughts on putting together an album, along with with basic plan I used for some Scrap365 pages, I made this. It's another page with a flap. I've written before about The (Not So) Small One's trips to the dentist. She has been brave and good and gutsy through a long treatment plan; and we aren't quite there yet. Five years since it started, she tells me: we're still going back every couple of months. The Five Year Face..and counting.. It started with an 80's combination: I'm seeing that pink and grey coming back; but I added some last minute splashes of colour and I typed right onto the patterned paper. Oh, did someone say 80's? It's 25 years since the first Comic Relief Red Nose Day here in the UK, this Friday, and I'm off to find a nose. Because I can feel another page coming on.. 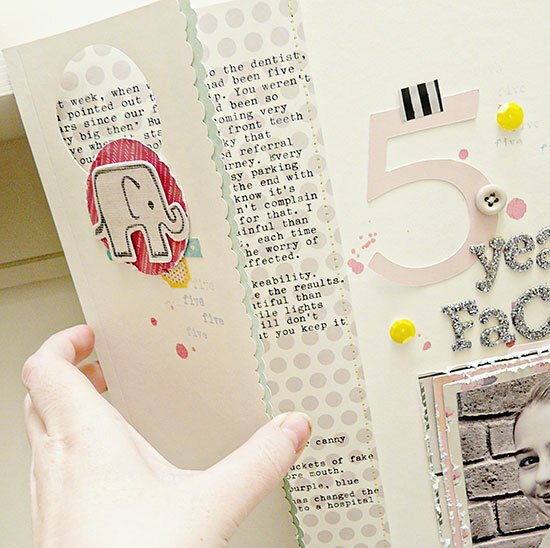 I love this hidden journaling with the cut-out circle. I'm quite sure I've never seen anything like it before, but also sure I'll be casing it at some point. Just perfect! Tell the Small One, I was also on a five-seven year plan at the dentist so I can definitely relate. It's probably a story I ought to tell as well. I've been seeing more 80's nostalgia on TV and such, and that really hits me where it hurts. Ouch. Lovely page, perfect solution for hidden journaling! Love the hidden journaling idea! I must have a go at that. Sian, I want to send the book on my blog last week to you. Can you email me pierce(at)tinyworld.co.uk with your address? I like your layout very much. The text peeking through the window is private but readily available by just lifting the flap. Your daughter is a cutie. I think it is why I love Project Life so much as I do tell much more there. This year I have combined project life and 12x12's into one album so that it all tells the story. I am currently writing blog posts about this change so hopefully will be able to show you how I am trying to tackle it! Love this journaling flap and the little circle that reminds the viewer to look for the journaling! Such a sweet photo of your little one. She is a beauty! Best of luck with her teeth. My eldest had some extra issues with her mouth but nothing like this time frame. My heart always goes out to dental pain as I've spent my fair share of time in the chair. I like the cut out circle....and the way it gives a hint of what's underneath. Really!!! 25 years!!! I would never have thought it was that long. Great page! I love how you've done the hidden journaling. I can relate to dental woes having had braces myself and then seeing both my sons go through it. Your daughter looks beautiful and so grown up! This page is so clever! 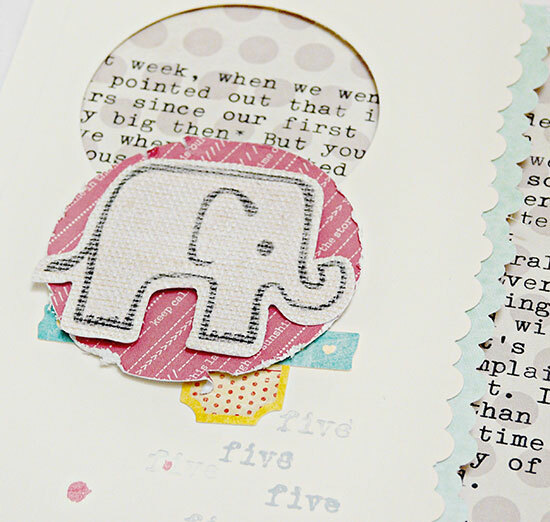 I love the journaling peeking through the hole and the focus brought to it by the cutest elephant! 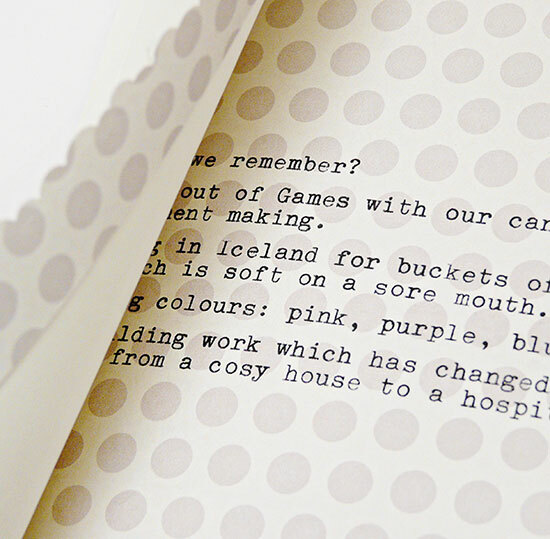 Ooh, I love the idea of the punched circle revealing a little of the hidden journaling - fantastic! Great idea for hidden journaling Sian! Oh goodness! this is TOP NOTCH! Love it! I can imagine I will have to give this a try myself. Nice part is that it is obvious that there is something to read! Good deal! Oh words! They so rock! I agree with everyone else, it's a great page design. I do hope, when the five year plan ends, that she will comfortably smile - it's a hard habit to break! I am a great lover of flaps and folds and this one is so very stylish. Love the little elephant! I love the peek-a-boo hole to give the clue, but I'm not a fan of having to remove pages from page protectors ... a dilemma! Gorgeous page though and I love the typing against the PP. What a great solution for hidden journaling - the flap is like another element on the page. Perfect! What a great idea for hidden journaling with that little hint that there is some journaling behind it. Finally getting around to this post. I have so much I want to say. First off, "the small one" is absolutely gorgeous!! You can tell she's ready to burst out in to a smile! Soon, I'm sure. 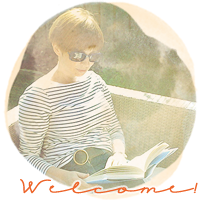 I love your page and the idea of the hidden journaling with the little tempting "sneak peek." I also liked how you sewed the edge. I'm going to give it a try myself. I need to put thread on the bobbin (for at least 3 months now), but since I, technically, don't sew, I have to get out the book! When you first posted this I thought TNSSO looked so pretty - now that I get to see the layout close-up, I cannot believe how grown up she looks!